When a quilt top is done and you’re ready to assemble the layers into a finished quilt, there are several ways to attach the layers together. There’s hand quilting. There’s machine quilting. And then there’s the simplest option, tying the quilt. Hand tying a quilt consists of stitching a tough, heavy yarn or thread through the quilt’s three layers and tying a knot to to secure the layers together permanently. Knots are placed at regular intervals all over the quilt. The knots hold the layers in place so they don’t shift as the quilt is used or washed. Photo by jessica wilson, Flickr. Tying is a good way to secure a quilt that doesn’t need fancy stitching, or quilts with very thick and puffy batting (also called wadding.) Thick batting can be hard to compress under the throat of a standard sewing machine for machine quilting. If the quilt you plan to tie will be bound with fabric strips around the outer edges, tie the knots before you bind the quilt. If you will bind the quilt pillowcase style (sewn around the outer edges, then turned inside out like a pillowcase, with no binding strips around the quilt edge), stitch the edges and turn the quilt right side out before you tie it. How Far Apart Should the Knots Be? The distance between the knots in a tied quilt is determined by the type of batting or wadding you use. Your knots should be no further apart than the recommended distance for the batting in this quilt. If the quilt doesn’t have batting, the knots should simply be close enough to prevent the layers from shifting. Ideally, the knots should cover the quilt in an even grid. Look at the quilt’s design to choose exactly where to place them. You will probably already have most of the supplies you will need in your sewing room. Washable yarn or a heavy, colorfast thread such as perle cotton, embroidery floss, crochet cotton, or ribbon. Wash-out or disappearing pencil or marker. (Optional) Rubber thumb tip or thimble to help pull the needle through the layers. (Optional) Buttons or charms to embellish the knots. Decide whether you want to tie the knots on the front or back of the quilt. Either one will work. Lay the basted quilt on a flat surface and smooth it to remove wrinkles. Mark the spots where you want to place the knots with a wash-out or disappearing pencil or marker. Thread the tapestry needle with the thread or yarn. Working from the center of the quilt out, insert the needle through all three layers and pull it back up as close as possible to the insertion point. Try to make the distance between the two points no more than ¼ inch (less than 1 cm). A thimble or rubber thumb can make this easier. Cut the thread so there are two tails, each about 2” (5 cm) long. . Tie a surgeon’s knot in the thread and pull it tight to the quilt. See how to tie a surgeon’s knot. Trim the tails of the knot to ½” (a little more than 1 cm). Continue knotting until you have covered the whole quilt. 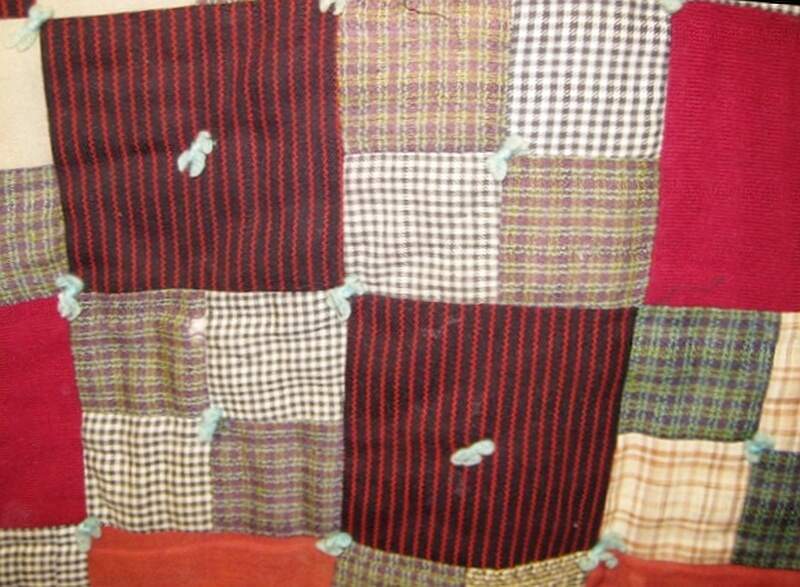 Here’s a quilt that was tied many, many years ago. Use the tapestry needle to insert the thread and pull it through the quilt layers. Thread the two ends of the thread through the button holes. Tie a surgeon’s knot on top of the button and trim the ends. Tying a quilt is simple and gets a quilt finished in no time. Try it the next time you need to get a quilt finished fast, or your quilt has thick, needle-resistant batting that would be hard to quilt with regular quilting stitches. Post photo by SewPixie on Flickr.com.